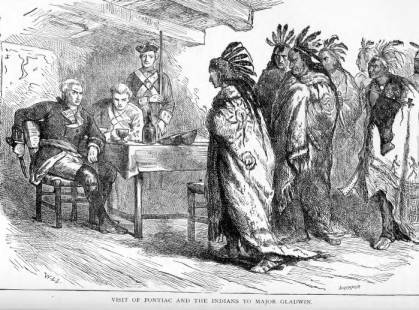 Illustration titled "Visit of Pontiac and the Indians to Major Gladwin." Pontiac, Chief of the Ottawas, united a coalition of American Indian tribes to resist British rule in the Great Lakes region and Ohio Valley. He led an uprising at Fort Detroit known as Pontiac's Rebellion in 1763, but the tribes were not able to overcome the fort's strong fortifications in spite of a five-month siege. After the conclusion of the French and Indian War (1754-1763), Chief Pontiac (Ottawa) led a loosely united group of American Indian tribes against the British in a series of attacks, referred to as Pontiac’s Rebellion (1763-1766) or Pontiac’s War. Participating tribes included the Ottawa, Ojibwas, Potawatomis, Huron, Miami, Weas, Kickapoo, Mascouten, Piankashaw, Delaware, Shawnee, Wyandot, Seneca, and Seneca-Cayuga. On February 10, 1763, the Treaty of Paris brought the French and Indian War to a close, and all lands previously controlled by the French were now under British control. American Indians in the Ohio Country, Illinois Country, and Great Lakes region feared the loss of their French allies and the influx of colonists from east of the Appalachian Mountains settling on their land. To prevent the incursion of colonial settlers, Pontiac encouraged Ohio Country tribes to unite and to rise up against the British. Many view the Ottawa attack on Fort Detroit in May 1763, as the beginning of the so-called Pontiac’s Rebellion. The Shawnee, Wyandot, Seneca-Cayuga, and Delaware Nations also raided British settlements in the Ohio Country and in western Pennsylvania. Is it estimated that by late fall of 1763, Pontiac's forces had killed or captured more than six hundred people. Britain's only garrisoned fort in the Ohio Country, Fort Sandusky, fell to the Ottawas that same year. In the autumn of 1764, the British military took the offensive against Pontiac’s forces. Colonel John Bradstreet and Colonel Henry Bouquet each launched invasions of the Ohio Country from Pennsylvania. Most of the Wyandot and Ottawa, but not Pontiac, surrendered to Bradstreet in September due to a lack of ammunition, as they could not resupply without their French allies. Bouquet forced the Seneca-Cayuga, Shawnee, and Delaware to surrender a month later. Although Pontiac did not formally surrender to the British until July 1766, Pontiac's Rebellion essentially ended in the autumn of 1764. The Proclamation of 1763, which stated that any land west of the Appalachian Mountains was to be preserved for American Indian reservations, did not prevent colonists from settling on American Indian lands which were supposed to be protected by the Proclamation. The Proclamation also stated that all non-Natives who settled on these lands previously were required to relocate east of the Appalachian Mountains. However, many colonists completely disregarded this legislation and continued to encroach on Indian lands, settling in particular on the Kentucky bank of the Ohio River, which instigated continuous conflict between colonists and the tribes who lived there. American Indian Tribes continued to fight colonial settlement on their lands and territories. Heightened tensions and regular skirmishes over land disputes characterized the Ohio Country and surrounding regions for decades to come. Editors of Encyclopaedia Britannica. "Treaties of Fort Stanwix," Encyclopaedia Britannica, July 28, 2009. https://www.britannica.com/topic/Treaties-of-Fort-Stanwix.